James has cemented his spot in the next Tournament of Champions. Our ToC Tracker shows who else is in the field. Did you take any of the online tests this week? You can find this week’s questions and answers here! Correct response: What is Fahrenheit 451? The premise of Ray Bradbury’s dystopian novel Fahrenheit 451 is that of a future American society where books are outlawed and “firemen” are directed ot burn them. (The book is so named because book paper catches fire at 451 degrees Fahrenheit). Guy Montag, the protagonist, eventually begins reading the books that he has been assigned to burn. Ramin Bahrani directed the 2018 HBO adaptation, which starred Michael B. Jordan as Montag. An average of 3.1013 5+-time champions (standard deviation 1.2195). An average of 4.8305 4+-time champions (standard deviation 1.5111). An early cutoff took place 3.265% of the time (or a 5-game winner will be left out). At $415,035, James moves to #4 on the all-time regular-play winnings list (passing Austin Rogers and Matt Jackson), and #14 all-time overall. 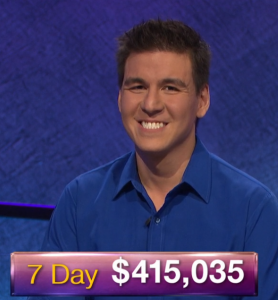 James’ $22,012 is a record for a player after the Jeopardy! round. The previous best score that I’ve been able to find is $16,800, from Matt Jackson on October 8, 2015. James is the first player since Austin Rogers to win all 5 games in a taping week. Alexandria Ocasio-Cortez makes her first appearance in a Jeopardy! clue tonight, as the $1000 clue in WOMEN IN POLITICS. It had been a week’s worth of episodes (and the previous tape date a week earlier) since James had bet $9,812, so Alex could be excused for not remembering James’ Sept. 8, 2012 anniversary. 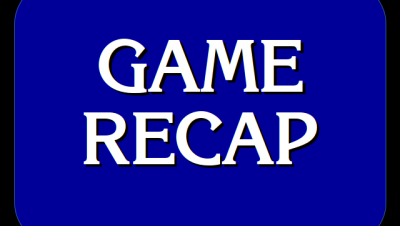 James’ performance of 32 correct without being incorrect (as well as getting Final Jeopardy! correct) is not a record. (It is known that David Madden had a game of 35 correct, 0 incorrect, plus Final). 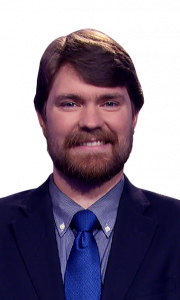 Through 7 games, the only 2 players who have earned more on Daily Doubles than James Holzhauer are Matt Jackson and Ken Jennings. Effective in first on buzzer stats: James 48.21% (27/56), Ali 26.79% (15/56), Mike 25.00% (14/56). 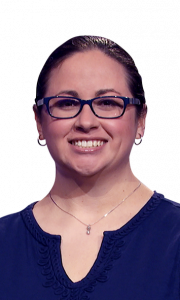 8 Comments on "Today’s Final Jeopardy – April 12, 2019"
One thing that I like about knowing who wins beforehand is I watch the game differently and see things I might have missed. It’s just that James now holds the 2 top single day top spots…. Is it correct that Matt and Ken exceeded James’ Daily Doubles earnings over their total runs or did they have higher numbers through 7 games? It’s a little ambiguous the way it’s written above. Matt and Ken’s stats are over their entire runs. 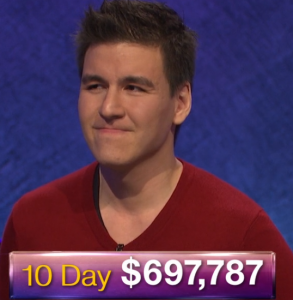 The combination of James’ huge bets and intelligence makes him the most exciting player Jeopardy! has ever had, to my mind. 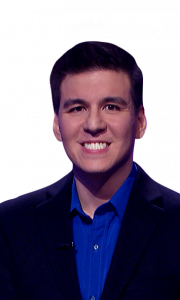 In terms of intelligence, he reminds me of Ken Jennings in that his knowledge is both broad and deep, unlike some other popular contestants who knew a lot about only certain categories. By the way, I love this site. It’s perfect for stat nerds!